Last week when the news hit that Topps was granted an exclusive MLB license, I lamented over losing UD. It had its faults, but so does Topps. While at Wal-Mart, I looked at the baseball card aisle and decided to splurge $20 on a 2008 Sweet Spot packs (blaster?). You really only get one pack with a guaranteed game-used jersey or autograph inside. I figured if I was going to buy something of Upper Deck, I would go out with a bang. It's not this exact card. 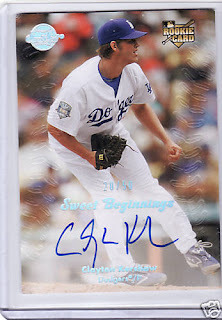 I borrowed this picture from eBay because I hate scanning cards, but I received a similar Clayton Kershaw autograph numbered to /50. It wasn't the Derek Jeter autograph I hoped for, but this was fun too. I promise this won't be the last pack of UD you buy. BTW, great pull on the Kershaw considering how bad most of that retail Sweet Spot is. The auto resembles something a chicken might do if you tied a sharpie to its leg but even so, that's a nice pull out of retail. I bought one of those Sweet Spot tins once from Target (got three doubles and a crap jersey bit) and vowed to leave them on the shelf from now on. I don't think I would buy that product (again) I have had horrible luck with it, but that is one sweet autograph (the subject, not the signature), great job and way to go out with a bang! Gah, every single blogger but me is pulling Kershaw autos. (I guess I need to pony up 20 bucks for one pack of cards). I've only ever purchased one pack of Sweet Spot and even though I pulled something great, I swore off ever buying another pack after watching a bunch of breaks online. I was lucky enough to pull a Griffey Jr autographed bat card. It would be nice if it were the only one, but there are five different versions of the card for around 800 - 1,000 total autographed bat cards. This product seemed to be much better when everything came in just one pack instead of 6 packs per box. Odds-wise, you did do very well. I've seen nothing but boring, single colored jersey swatches come out of the retail packs. It should be noted, I bought one of these last year. I got a Pudge Rodriguez Yankees grey jersey card. Night Owl, you just gotta buy more retail apparently. I pulled my Kershaw Heritage auto out of a loose (and partially-opened, searched) pack at Target this year. UD still has the players license. Losing the MLB license will be the best thing that ever happened to UD and collectors. They're going to be inserting more/better auto's with all the $$ that they would have normally paid to the greedy owners. Sweet Spot was exclusive to Target (and hobby) so you couldn't get it at Wal-Mart. Except while I was at Wal-Mart, they had a pack of Sweet Spot for $20.